There are days when the best course of action is to buy @berenbaums completely out of hamantaschen. Like today. Our awesome customers: Shouts to William, AS, Horst, Yulya, and Richard. The indomitable crew: Shouts to Val, Andy, Chef Matt, Jaime&Nancy, and SZ. Most of us were pulling double duty with the Ramen Shop so it was a long day but well worth it. The scene: Motivated by the creativity and palate of David Chang's Momofuku empire, Matt Props and I designed a one-night-only ramen shop at Ninth Street Bakery. The overall vibe was very good. Close quarters combined with Japanese comfort food helped ensure an informal tone and the menu's product quality was top-notch. Shout out to all our customers -- many bakestand patrons, FB followers, and Durhamites in-the-know came out, along with two Triangle rock stars (who just happen to be vegan). From the get-go (5:30PM), we were slammed till around 10PM. Sorry to all the folks who made other plans as the wait for a table quickly backed up to more than two hours. We will likely expand the set-up next time to accommodate more patrons. Arriving super-early or super-late is still a good move regardless to assure a seat. The product: The ramen was strong strong strong. 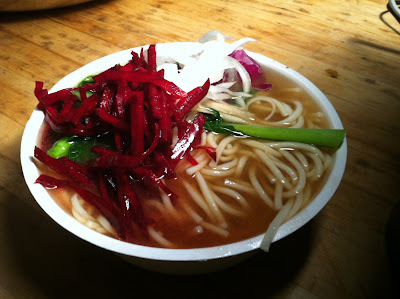 We ended up doing garnishes of chinese greens, red cabbage, pickled beets, and daikon. The crew: Extra big thanks to Val, Andy, Chef Matt, and RML (!). Prep and execution made for two long nights and you guys are like marathon men and women dedicated to a culinary cause. Next Up Pop Up: Ottolenghi? The product: This week we had Thai Peanut Savory Vegan Hand Pies, Spiced Pear Sweet Vegan Hand Pies (awesome! ), Sunflower Bread, and Curry Soup with Green Apple and Avocado. The scene: There was much shivering and hopping up and down this week at market as the snow fell and then turned to a freezing cold rain. Extra big ups to Sara&Jeff and Claire for holding down the stands -- y'all are the green berets of open-air market selling. Shouts to our customers: Dan, Lisa, AS, Julia, Yulya, Amy, and William. Da Infamous Crew: Chef Matt, Val, Andy, Claire, Sara&Jeff, Jaime&Jay. 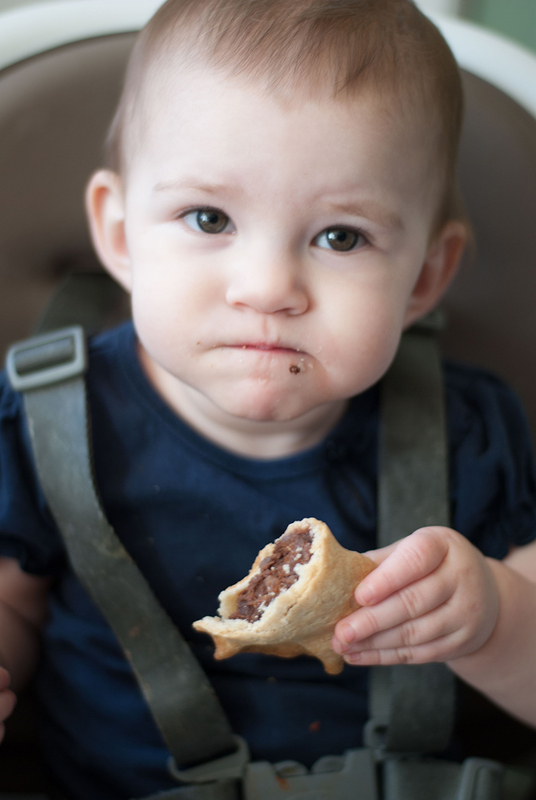 Cafe Update: You can now find our savory vegan hand pies at Cocoa Cinnamon on Geer Street. If you go in, give owners Leon and Areli a shout, and tell them how awesome their new cafe looks. 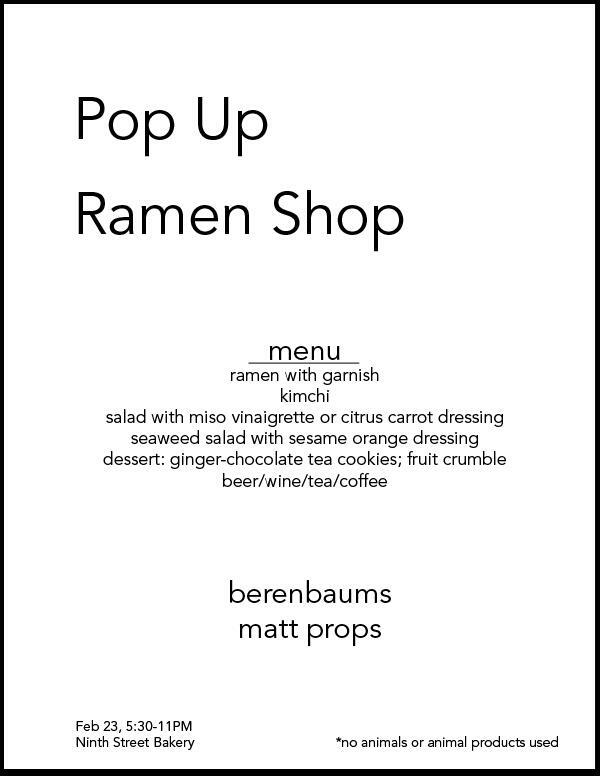 This week: Pop-up Ramen Shop this Saturday night. We couldn't be more excited about this (David Chang-inspired) event. One night only, we hope everyone can get a bowl. The product: This week we had Abuelita Hand Pies (bananas, walnuts, dark chocolate, vanilla), Cuban Black Bean Hand Pies, Blueberry Lime Tartlets, Valentine's Day Sweetie Pies (see below), Daikon Kimchi with Pineapple, Buttermilk Biscuits. My mother uses this phrase. And my aunts. And my great aunts before them. It sometimes includes a pinch on the cheek as they try to decide if I've grown a second head in our time (and distance) apart. "Oh, come here you sweetie pie!" my Aunt Eve would growl. My mother is a pie baker. And my aunts. And my great aunts before them. When I started baking pies on my own four years ago in my teeny tiny studio apartment kitchen, I never imagined forming hundreds of hand pies every week for Berenbaum's. Together, we are trying to find ways to make more pies. 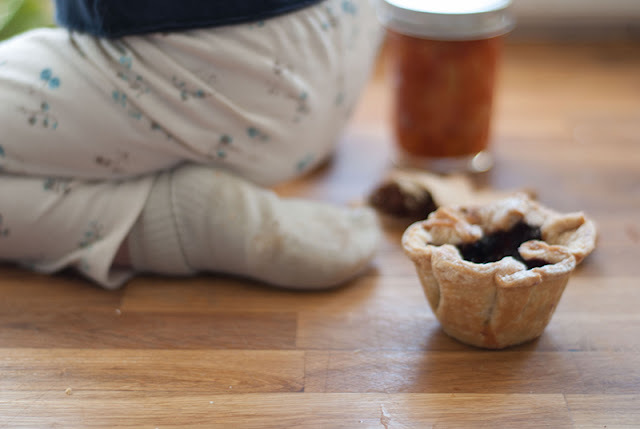 This past Friday night, making Sweetie Pies, I could feel the pinch of my cheek and the breath of ancestors on my neck, and I couldn't have been happier! 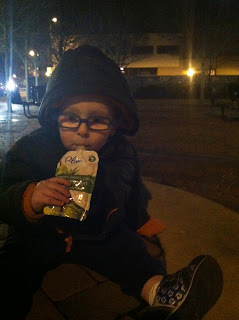 Our awesome customers: Amy, EC&SMG&RG, Ali&Esme, Beth&Edith, William&Friedrich, AS. Esme with the goods, photos by Ali R.
Da Crew: Many shouts to our competent, creative crew: Val, Chef Matt, Andy, SZ, Sara&Jeff, Nancy&Jaime. Double-shouts this week to Val who helmed the Blueberry Lime Tartlet recipe and the Sweetie Pies. South Durham Market Update: The South Durham Market has been grinding through its first winter season, and the leanness has stoked the imaginations of the Board to increase publicity and traffic. We now have gigantic wind-blown signs at the entrance to Greenwood commons, along with road signs off the I-40 exit. I'm excited that these changes, along with others in the works, will really increase patronage come Spring. We will be making Blueberry Lime Sweetie Pies for Valentine's Day. This is a 10-inch pie with the words "Sweetie Pie" written in crust lettering on the top. Suggested price is $20. Ingredients: Blueberries, Sugar, Lime Juice, Lime Zest, Tapioca, Flour, Butter, Water, Salt. The product: Chef Matt's Black Bean Mole Soup was one of the best chilis I've ever had, vegan or otherwise. He said that he won a Chili contest with that recipe two years ago. Wow. Durham residents didn't exactly know what to make of the King Cakes -- we sold about 25 of the 40 we made. Perhaps it is just a New Orleans thing, or perhaps the colored sugar scared off some of our more "artisinal"-minded customers. A few customers knew to ask if there was a baby hidden inside (there was), and one family originally from New Orleans was giddy with excitement, especially because it is hard to find good King Cake these days even in New Orleans (they carry it at drug stores and supermarkets and the generic version tastes like a sodden Entenmann's danish roll). Our brioche filled with cinnamon and pecans was certainly a step up, without the overdose of icing sugar on top. Our superlative customers: Alex&Brian, Yulya, Stan, William&Freidrich, Beth&Edith, Linda. Shouts to our regulars and everyone who came by, especially those who are really digging the Kimchi -- y'all are motivational. Da Crew: Many thanks to our awesome crew this week: Chef Matt, Val, Andy, Jaime, Jay, Claire, and SZ. Special thanks to Val and Andy for uncovering the mysteries of making colored sugar with me. This week: Valentine's Day Specials next weekend!